The U.S. Dept. of Energy (DOE) National Renewable Energy Laboratory (NREL) is planning a microgrid controller ¨bake-off¨ as part of a broader initiative launched by the Office of Energy Efficiency and Renewable Energy (EERE). NREL will participate in four Lab-Bridge projects, the goal of which is to strengthen links with industry participants to accelerate commercialization of innovative cleantech. NREL also will serve as the central exchange for knowledge transfer among all eight Lab-Bridge projects. Thirteen DOE national labs and industry partners ¨will explore, test, and validate innovative ideas and develop novel approaches to fast-tracking new technologies to market,¨ during the next 12-18 months via the Lab-Bridge program, NREL explains. Among NREL’s four is the Microgrid Controller Innovation Challenge, which will give the top eight applicants the opportunity ¨to test their microgrid controllers in a standard power-hardware-in-the-loop configuration that combines hardware with real-world grid scenarios at NREL’s Energy Systems Integration Facility (ESIF).¨ The challenge application period is slated to open next spring. Evaluating the ability of the microgrid controllers to integrate and manage electricity generation from variable, intermittent renewable energy sources, eg. solar and wind, is one of the main facets of the three-month challenge. Another is evaluating their ability to stabilize the grid when outages or internal faults occur. “We’re excited to bring NREL’s strengths of delivering clean energy technologies to the market through the next generation of Lab Impact programs,¨ NREL Laboratory Program Manager Liz Doris said in a press statement. 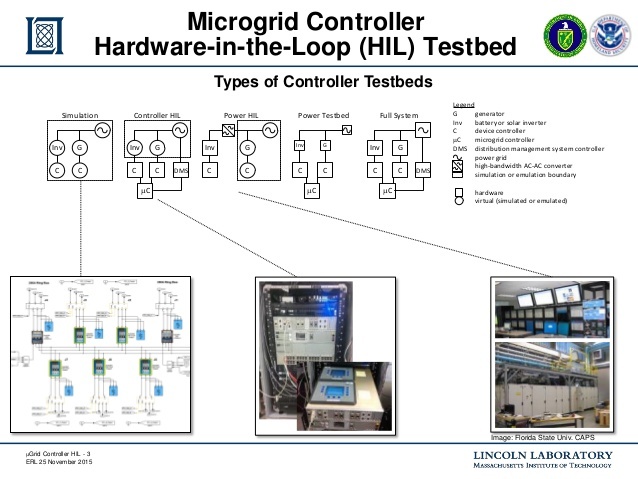 MIT Lincoln Laboratory is supporting NREL in this initiative by providing much of the software necessary to build NREL’s microgrid controller testbed capability, MIT-LL’s Erik Limpaecher pointed out, adding that MIT-LL will describe the software it developed for NREL’s microgrid controller testbed during the Microgrid and DER Controller Symposium it will be hosting this coming February. Intellectual Property Bundling, which utilizes a unique algorithm developed at NREL that is capable of identifying complementary intellectual property across multiple DOE labs and combining them into a selection of industry-ready, multi-lab technology packages that have a larger value than a single lab patent license. The objective of this collaborative lab project is to simplify licensing for industry partners. The Lab Technology in University Business Plan Competitions project, which promotes the use of lab-developed technologies within university business plan competitions. Pacific Northwest National Laboratory and NREL will work together to design and execute a “lab technology track” in several collegiate business plan competitions such as Cleantech University Prize, which provides clean energy entrepreneurs and innovators with competitive funding for business development and commercialization training and other educational opportunities. The Lab Accelerator project, which is a collaborative lab effort to support a more comprehensive DOE Lab-Corps approach and move technologies to market by helping scientists understand their potential customers and interact with industry experts. ¨DOE is investing $2.5 million in this project because we know that it will accelerate our transition to a clean energy economy,¨ U.S. Deputy Secretary of Energy Dr. Elizabeth Sherwood-Randall said upon announcing Lab-Bridge at NREL in Golden, Colorado. Lab-Bridge builds on the knowledge and experience gained in similar, previous initiatives launched under EERE’s Technology-to-Market Program, the deputy energy secretary noted. DOE’s Lab-Corps pilot program was the first such venture. By December, 50 teams from 10 national labs will have completed a clean energy technology commercialization training course, the aim of which is to enable them to better understand the value of innovations in the marketplace. Known as Small Business Vouchers, Lab Impact’s second pilot program brings together 12 national labs and nine EERE technology offices to offer small businesses greater access to national lab expertise and facilities.